Rokuro Uchida at Aloka® had similar research on the linear-array technology in the late 1960s predating their European counterpart. 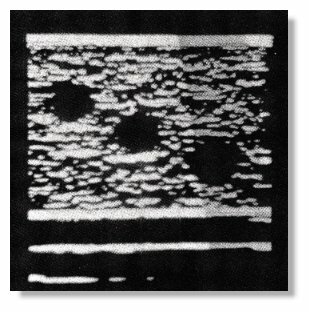 In 1971 they published in Japanese (and presented at the Japan Society of Ultrasonics in Medicine) a system based on 200 closely interspaced transducers. Electronic switching and use of overlapping groups of 20 small elements yielded 2-D images with a field depth of 20 cm at a rate of 17/frames per second. 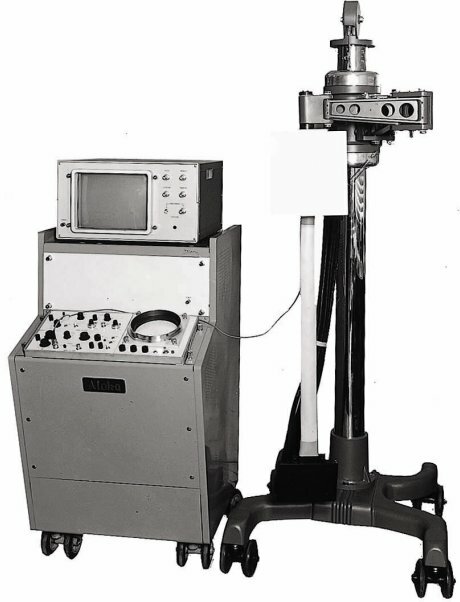 The company produced this first prototype linear array scanner in the same year. It was a relatively large machine resembling the mechanical scanner 'Vidoson' from Siemens in Germany. The model however, was not produced commercially or given a model number. The first commercially available linear array scanner from Aloka® only debuted in 1976. Rectangular real-time image of a test object. Read also a short history of ultrasonics in Japan. Images courtesy of the Aloka Company.